What are the factors that every pet parent looks for when selecting a boarding facility for their child? I believed that Meera Thosar’s Happy Tails Dog Boarding in Bhugaon, Pune, had all of the above, and hence selected it to keep my boys. I spoke on the phone with Meera asking if she had vacancy for the days I wanted and the conversation ended up with an appointment for a trial. I met Meera Thosar on the day of the trail and sat down with my boy, over a cup of tea, and explained in detail about heat control management for my boy. Being a veterinary doctor, I would never let something like heat control go without emphasising on how he should be kept inactive between 12 pm and 6 pm. I also mentioned that during this very hot day period, Rufus should be taken out just to pee and back. This whole procedure should not exceed more than 5 min, and after that a wash down, which I demonstrated in her dog bathing area before I left her kennels. I also said that during the day if my dog was uneasy with the heat, to wash him down 4 times between the 12 pm and 6 pm time slot. This is my normal protocol that I give all my clients who have small breeds for heat prevention along with more detailed instructions. I spent 2 hours with Meera and explained about both my boys. I admitted my boys the next day at 8:45, settled them in, spoke to her staff, gave them the milk to put in the fridge, and the water bottles that I got for them. Explained to them as well, what time to give Manus his cold milk (Manus is a Siberian cat that I rescued in St Petersburg, Russia. He was a very sick child, but has survived and is now 14 yrs approximately). I told them as well about the inactivity during the 12 pm and 6 pm slot and said goodbye to my boys and left for the neighbouring kennels, where I work for canine control and care. It was 10:30 am. I left the canine control and care kennel and, on the way down, saw that Meera had not arrived at the kennels. Her neighbor, who is the owner of canine control and care, said she had not come till around 11! I sent her a message at 12:46 pm where I told her about the milk that I left for Manus …. kind of like a gentle reminder, in case she forgot to feed him his cold milk. I got no response. So I called an hour later and she said the boys are doing fine and that she will send me pics in a bit. At 3:02 pm, I sent another message asking for photos and I got nothing. At 4:30 pm, I called and said Meera where are my updates?? It's just DAY 1!? She called saying Rufus was playing around with her girls, and asked how long it took for him to cool down. 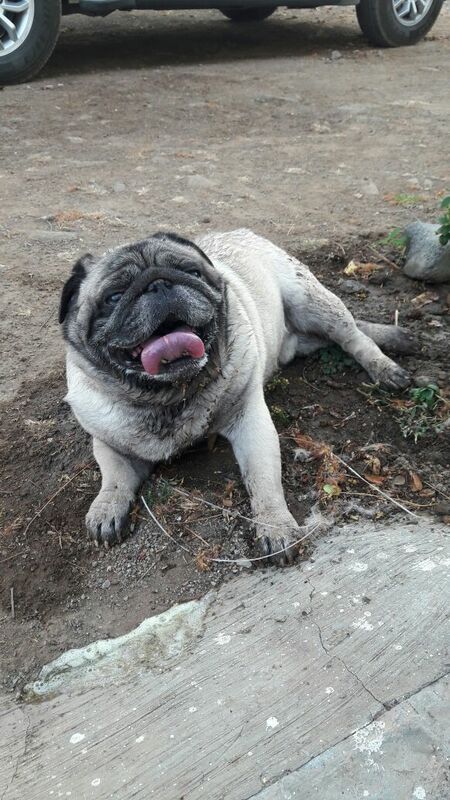 I said, after a wash down usually 10 min, the heavy panting stops, and in 20 min, he's completely cooled down. How am I so confident with this? It’s because I shut my clinic down over the weekend and spent the entire weekend monitoring and making him adjust to the heat wave, which is common during this time, because it was the EQUINOX! I even told Meera, at the trial, during one of my stories, that Rufus had a heat stroke 3 years ago in Goa, and to be very careful with the panting. Rufus has been operated for stenotic nares and elongated soft palate surgery. He has flown 18 hour flights with 8 hour transits, walked thru 4 airports and travelled from Delhi to Mumbai - a one hour plus flight in summer, in cargo, and he survived that. He ran on the beach with 6-month old Doberman puppies. He survived that as well and never has his tongue flared up that bad! Even his heat stroke in Goa was not so intense. In Goa he collapsed, but after drips he was back to his old self. In this case, my dog could not stand up. He was disoriented and overheated to a point that when I saw the video, my world crashed because I knew I had lost my boy. By then Meera had already left for Dr Hatekar’s clinic, where he guided his doctors on the phone very vigilantly and with brilliant punctuality. By the time I arrived, He was already on the drip and on oxygen but was having seizures, not muscle cramps. His muscle were cramping because he was SEIZING!! I asked the Doctor on call what condition had he come in, and she said he was gasping, panting and having seizures. His oxygen level was 50 and his body temperature was 107 degrees!!! His paws were so hot, for how long was he running that temperature, I don't know, because when I asked Meera to check his temperature at the kennel, she said she did not have a thermometer!! The neighbouring kennels canine control and care which takes care of stray dogs postoperative care has a thermometer! Whereas Meera Thosar’s Happy Tails facility did not?? 107 degrees for more than 45 minutes, combined with severe dehydration, causes irreversible internal organ damage!! And 72 hours post a heat stroke is considered critical! Dr Hatekars team was with my Rufus till 10:30 at night and brought up his oxygen to 100, and body temperature to 101.6 degrees. He was also sedated because he was seizing every 8 minutes. We left the clinic with both my boys , on the way I arranged for oxygen to be delivered to my house, thanks to very well connected friends. Once we reached home, I put Rufus back on oxygen and a very slow drip as his body temperature started climbing. I wrapped him up with cold cloths and ice packs, monitored his temperature and got it stable again by 3 am. In the morning he was alive, but lifeless. It could also have been because of the sedation and exhaustion. I continued monitoring and symptomatically treating him. His breathing was still not improving, but he made 24 hours, and all thru that time I told him how much I loved him, and how proud I was of him, and how brave he was. The same thing repeated at night. I was monitoring him every 2 hours till morning. He barked when the doorbell rang. 2 barks, but I was happy, the same routine followed. He was so patient, but I started getting this haunting feeling in my gut that my boy is giving up. The other day, when I put up a memorial photo of my boy, one of my friends commented and asked me how my boy died, and I said it was because of the negligence of Happy Tails. Meera had the audacity to ask me, how can I say it was negligence? She said she made the correct decision to take him to the vet. Why and how did he get to this point of overheating, when you were told over and over again on its importance? Why was she not present at the kennels? She said in her post how she arrived at 5:20 to the kennels with her dogs, so where was she all day then? And why was my boy outside at that time when my instructions were to be inactive from 12 pm to 6 pm? That day the temperature was 41 DEGREES! She mentioned my boy did not complete his toilet duties. My boy has been toilet trained in minus 31 degrees in Russia. He was trained to do his job in 10 minutes! And even ...even if he did not do his duties completely, my instructions were short walks, just to pee, do a wash down and back inside. He could have been walked post 6 pm? We all are hard working people and we all have to go thru the whole “sit at your workplace for 8 hours a day” routine. Happy Tails is Meera’s job, so why was she not at her work place? Why did I not get any updates the whole day? I do this for my clients as well. I, very honestly, will tell a person I am not in capacity of knowledge for this surgery or case, but will always refer a good doctor. But instead she said “Don't worry, na. I’m here only. Daily from 9:30 to 5:30. I’ll keep an eye on them." 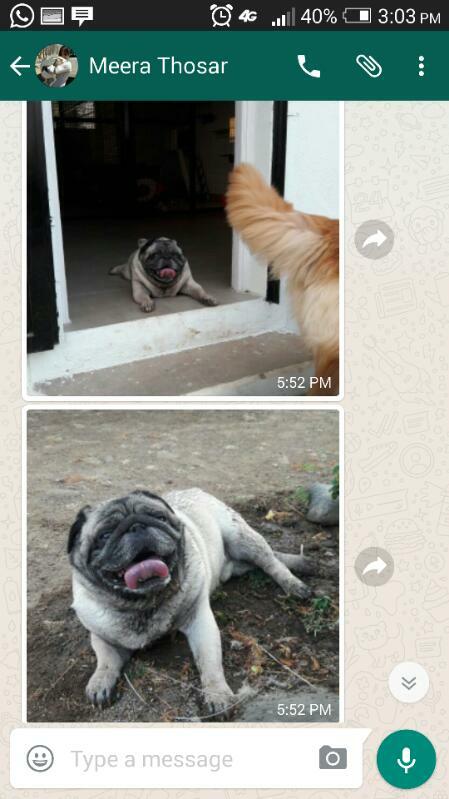 And the only photos and video I got, was of my dog dying ….after 5 pm! Meera had messaged and said she wanted to plant a tree in his memory. I instead asked her to write out a public apology, because admitting to your mistake is something that will give my boy and me peace. But instead, she writes out a post on how heroic was her decision to take him to the vet on time! My question is, why did he get to this point in the first place? DAY 1…. and Meera Thosar FAILED as an owner of a so-called experienced boarding facility. This is a public apology to Dr Hatekar. Respected sir, with all respect, I apologise for having caused you any distress, and have no intentions of giving you or your practice any malice. This entire issue of Rufus is between me and the owner of Happy Tails. My dear Anushka. I am so sorry this happened to you and your boy. I know this will not bring him back but I am happy you have made this public. Let this never happen to any beloved pet put in boarding. Hope this brings you closure eventually and a change in the attitudes of people who are given the momentous responsibility of taking care of our children. Dear Anushka, I can empathize with your loss and however sorry I may feel words will never be able to console the emptiness that your little boy has left you to deal with. This is a story that will and should awaken every pet owner and people involved in pet care to give due diligence to the task at hand. It is time we revolutionise pet care in India. It totally broke my heart & made me super angry on reading about your boy. It was criminal negligence on the part of Happy tails (there is nothing happy about dying by a heat stroke in a paid for facility). May your baby rest in peace & you get the strength to deal with your untimely loss. Did you manage to finally get an apology or are they still denying their role in the tragedy? Please keep us informed. We support you. Please share this on her Facebook page. As people try to find out if it is a good option. Such reviews are as essential for the parents to take such a crucial decision. 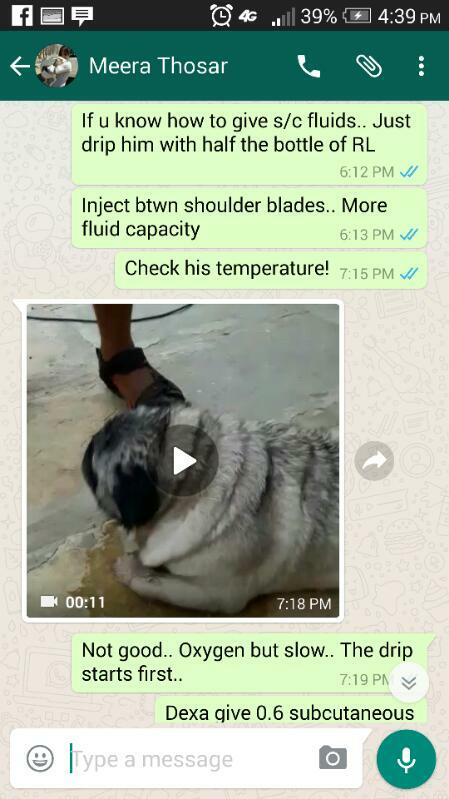 All the pictures and video were sent to Dr.anushka to update her by meera, we have videos captured by cctv in clinic where Rufus had settled in clinic in 3 hours of time with 94 % oxygen perfusion , his blood pressure had returned to normal Dr Anushka is not telling her story that we had offered her to keep him in clinic and watch him. He already had same episode of heat stroke last year which she is not mentioning it. She was well aware that Pugs have breed predisposition to heat stroke and 98 percent airlines don't fly Pugs for same reason. Anushka is not accepting her mistake and trying to defame and take revenge . She was offered oxygen cylinder by us which she refused to take and neither allowed to do blood test at our clinic. Rufus had settled while leaving the clinic . A close watch continuous oxygen supply , fluid therapy , heart rate blood pressure monitoring and experience would have saved him. He feel sorry about his loss but If anushka would have been sensible to keep him in our care would have saved him. We as a team support Meera Thosar for her efforts to save Rufus. Unfortunately only we know the other side. This post is just to threaten people who have experience in field and take advantage of sorry feeling . Very unethical ,unprofessional approach by Dr Anushka Adele Lobo. The veterinary council of India will be checking her educational credential soon. Milind Hatekar - why are your deleting posts that question you? It is obvious that you are trying to cover up what is clearly a case of gross negligence on the part of Happy Tails and who ever is associated with it. Is the veterinary council a family business that they will investigate Anushka instead of you and your "team". Is this a threat to get her to retract? or just a desperate attempt to cover up your incompetence. I think the best thing that Anushka did that day was to take Rufus home with her and care for him till the end. I doubt that you or anyone would have been able to do even 10% of what she did. If you and your team were so knowledgeable and experienced why did you not refuse to take Rufus in? obviously money is more important than life for you. Anushka is venting her grief and frustration as a responsible pet mom and her qualifications do not come into question here. Once again - back off and leave her alone. P.S. - keep deleting, i will keep posting. I'm curious about the above comment - because it shows up as anonymous - so I don't know who has written it. For the record I have NOT questioned line of treatment taken by the vet who treated my animal. I respect and stand by whatever decisions the veterinary team took. I have only pointed out issues with the Happy Tails Boarding Kennels - who incidentally haven't replied to this at all. The are welcome to tell their side of the story. But I'm not sure why my actions of revealing obvious lacunae at the boarding kennel being termed unethical? This also has nothing to do with me using my education - but for anybody who wants, I am a qualified veterinary doctor with a clinic in Camp, Pune and I work for Canine Control and Care. My educational qualifications are open for anyone to check and verify. The above post is an identical post from Dr.Hatekar on FB too. Anushka Adele Lobo is the most caring vet I have ever come across and neither she or her pet had to go through this tragedy. When we share details of our pets in terms of what works for them what doesn't it is not to try to tell the owners of a pet boarding facility that we know better and telling them how to do their job, but each dog and their requirements are different. We know better than them where our pets are concerned and hence all the details should be carefully taken into account. Negligence is unacceptable and I feel precautionary measures are always better than preventive. For most of us our pets are our world and this shouldn't never have happened​ in the first place! And lastly if you are running the show you must be there no matter what! A sincere apology is all what Dr.Lobo wants from Ms.Meera the owner of Happy Tails. 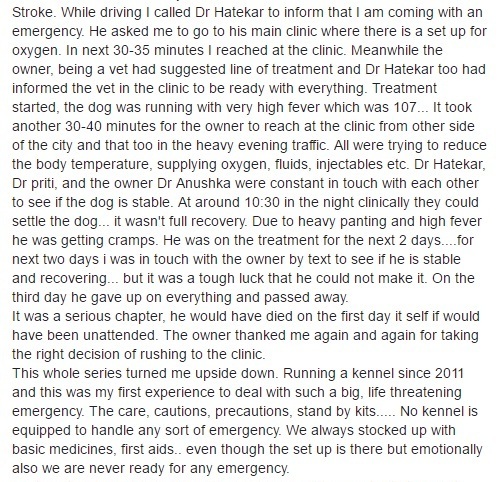 An apology of negligent behaviour on her part which apparently she refuses to admit it to and things are taking an ugly turn where Dr.Hatekar is actually blaming the Pet Owner and threatening to review Dr.Lobo's educational credentials when actually it is Meera who has to be anwerable and accountable. The video shows what condition was Rufus in and there are just no two ways of defending the fact that it was a case of Negligence. It is times like these that sends shivers down your spine and also makes you stand up for what is right. I am appalled by the attacks on Dr.Lobo and it is she and her husband who are the grieving family and Ms.Meera who needs strength. Anushka Adele Lobo, my dog kenzo was kept in happy tails a few years ago. She was there for 5 days and when we went to pick her up she was skinny, and completely dehydrated! When it comes to lack of communication, my friend @faraz faced a similar situation just two months ago, when he left his dog there. Dr. Anushka is an excellent vet who's always been available every time my dog has had the smallest of problems and thanks to her, my dog is in the pinkest of health. This was a case of negligence and questioning her credentials for no reason, is really insensitive and has no connection to the events that transpired. It is such a shame that just because she is a friend people are willing to justify this act of criminal proportions!! On the happy tails page there is a review from 2014 where someone is complaining about the same issues that meera has no fans or cooking system for the dogs etc. Clearly she hasn't listened to the feedback from 3 years ago and it is all about the money for this lady!! If only she could be brought to justice with the law but I can only hope that she comes to her senses and issues a sincere public apology. I support you and will not rest until this is done!! God bless you and please don't let their pressure stop you. We are here for rufus! It is so heartbreaking to see our boy die in front of us. Thanks so much Anushka for opening up this incident and bringing in light the horrific truth behind the boarding facilities. I feel there is not much love left in people, and the boarding facilities have just turned into money-making business. When a pet boarding facility tells you to not worry, we believe them. As a pet owner it isn't easy to forgive or forget. It isn't easy to watch your pet dog die, and even worse when the facility at fault refuses to acknowledge its fault in the process. To the person who made an anonymous comment - Dr. Lobo clearly states right at the end, that she isn't demeaning or criticizing Dr. Hatekar's efforts. This is a situation that involves only a pet owner and a pet boarding facility. Please don't distract readers from the main issue here. For Meera, Dr. Lobo is first a pet owner and an experienced vet. Her question is simple - Where was Meera, the owner of this boarding facility on the very first day. That definitely doesn't call for making a good impression on your clients. If you want to treat every dog, casually even when you have been informed about every minor detail with regards the pet's health and medical conditions, then how can you still be so ignorant? There is nothing to feel proud about, when it comes to driving a sick dog to the emergency room. It should never have reached that situation in the first place. Even if Meera, had other priorities at hand, why schedule a trial on the very same day? Even if Meera, had her own personal problems to deal with, like we all do, why not inform Dr. Lobo from before? Why take this responsibility when you have the pet owner in the same vicinity? Leaving a pet dog, who already has a traumatic medical background, needs severe care and attention. And if a qualified vet, is giving you instructions, isn't it ignorance on your part for not taking those instructions into consideration? In fact, the very absence of the owner Meera shows she made a promise to her client, not a friend or a vet, but a client that she disappointed in the end. The loss of a pet, isn't a joke. Yes, sometimes when a case goes into a critical condition, it is difficult to turn things around. But such a critical case, can also be avoided. That was the responsibility of the pet boarding facility. Dr. Lobo was communicating, thoroughly and Meera, who has had experience in the past, should have responded well in time and with precise details about Rufus's condition. If this means, giving a dog, extra care and attention, remember that you are also being paid to do so. As a pet owner and a pet sitter, it is the dog that matters the most. And if you have other priorities to tend to, don't get into the picture. Jeopardizing a dog's life, just so you can make money, isn't part of this business. It may be a business, but it is a life at stake. Right now, Dr. Lobo is grieving and Meera Thosar, the owner of Happy Tails, should admit that she was unavailable to give sound updates on time. Everyone knows that once a dog reaches a critical condition, every kind of help and effort is solely meant for the purpose of saving the dog. So yes, in gratitude I'd say that Meera did one thing right, she took Rufus to the doctor, it does not matter if it was on time or not. The point of this entire conversation is that, there was negligence involved and the fact that Meera refuses to admit this, is quite frankly sad. Even if there is another side to this story, the question that remains in everyone's mind is that, why was Meera not present at her facility? Is Happy Tails, your office or just a place for leisure? If you're marketing your services, like a professional, it is high time you start acting like one. Pet owners don't mind honesty, but we certainly don't accept irresponsible behavior and absolute lack of communication. If you do have a story to tell, before Rufus was taken to the hospital, then kindly publish enough evidence to prove a point. In the end, Rufus has left this world, and the mystery still remains why he had a high fever, which managed to develop within a span of 8 - 9 hours? I support Dr. Lobo's call for justice, which is in fact just an apology from the boarding facility. I hope as dog lovers, they don't allow their ego and ignorance to get in the way again. We pray for Rufus, and may his soul rest in peace. Anushka, I am so sorry for your loss. It pains me to even think of such a misfortune. Being a pet parent myself, I know what kind of pain and effort goes into actually leaving your kid in a boarding facility. I am specially sorry because I faced a similar, though not as tragic, incident at Meera Thosar's Happy Tails very recently and I did not raise my voice soon enough so as to serve as a warning sign for all pet parents considering Meera Thosar's facility as a boarding place for their kids. We were planning to leave our 14 months old cat, Kate, at this facility. We decided to make a test run before the actual dates to ensure everything goes smoothly. 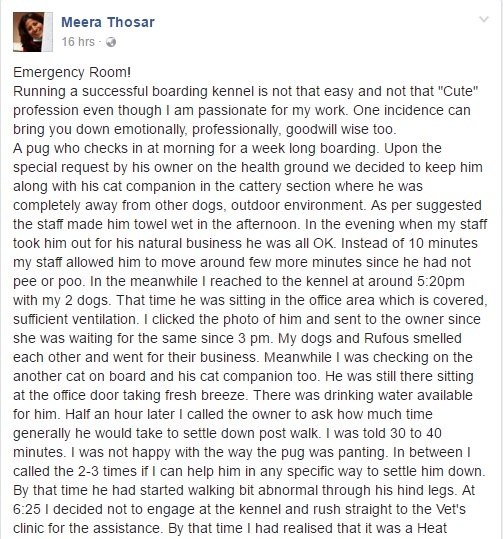 Similar to what you have described, the first meeting with Meera to decide everything went well and we were content based on the claims this woman makes about her and her staff's experience with boarding cats. On 21-3-2107, we reached the place at 11am. We had to literally go inside the complex and shout out to attract attention of the staff. We stood there for 15 minutes after which this staff member emerged from the kennel area. We repeated all the instructions regarding the feeding habits and general behavior of our kid. We noticed that even in that hot morning, the fan wasn't switched on. We specifically asked this person to have the fan on at all times. We had taken the food we give to Kate along, I remember mentioning it at least five times to this person, to have the dry food out at all times and giving at least a packet of tuna in that span of 24 hours. We had also requested to have the water bowl full to the brim at all times as our baby has this specific habit of not consuming any water if the bowl is not full to the brim. We had specially requested Meera to ensure that someone spends time with Kate in the evening as that is when we engage in play time at home. On reaching home I wanted to contact the facility right away to ask about Kate, but we decided to wait a little while as Meera had very confidently assured us that she would herself be there and would send us photos and videos of our baby. We waited till the afternoon, but there was no response. Even upon sending her multiple texts and even trying to reach her on the phone there was no response. She would read the whatsapp messages but won't even oblige us with a simple response. She didn't answer a single phone call we made for that entire day. We couldn't sleep that entire night. Next morning, we reached the facility by 8:30am. This time the same person showed himself after a good 20 minutes. What was shocking was that he didn't even remember us from just a day ago. He mistook us for someone who had left their dog with them. We had to remind him about our cat. Finally when he took us to the cattery, we saw that the fan was switched off, there was no one in the area, the packet of wet food we had given was kept untouched on the table and a huge bowl of water was kept half filled in the enclosure. We found our baby sitting in a corner, nose completely dry and very warm. While all our efforts to contact Meera the previous day had gone in vain, the moment we called to ask for the payment, she answered the phone. I had tears in my eyes for inflicting this on my kid. We later noticed after reaching home that Kate was also injured in the paw. When we tried to tell Meera about the horrible experience, she became very defensive and didn't even own up to the gross negligence we noticed for ourselves. It is very clear that Meera Thosar is not the animal lover she claims herself to be. She is just a ruthless business person, who has absolutely no interest in the well being and safe keeping of our pets in her substandard facility. While our troubles come no where near your loss, but I do understand the pain you must be feeling, Anushka. Request you to please share this on the various pet groups and pages on social media, so that the truth about Meera Thosar and Happy Tails could be revealed to every pet parent in and around Pune. Please do not let this issue go off easy. Even when I had come in at 8:45. The fan in the cattery was off and I told the boys to leave it on all time. It's like she's saving money on her bills. Was Kate the long fur pretty cat? Leave your review on her fb page as well.. This behavior is unacceptable! I am feeling so sorry for Rufus. He was so adorable. And whatever I've read above I can see that happy tails is just being so unprofessional and the owner of the Happy tails should have never left the place. People keep their kids with lot of hopes and trust. They should not be treated like a flock. Personal care is expected. I'd tears rolling down when I read this post. I'd seen Rufus in Dr. Anuska's clinic. He was very adorable and obedient baby. Dr. Anuska is a person who gives every single detail of how any of her patient should be monitored and taken care of. She personally keeps a check keeping updates from her patients parents. There is no doubt in her instructions given to Happy Tails regarding Rufus. Happy Tails should make a note on such special cases. Fur babies need to be treated more carefully. As like human they cannot tell of their suffering. The vedio was terrifying. Dr. Anuska I support you. Hoping that no other parent gets to suffer like the way Rufus had to. 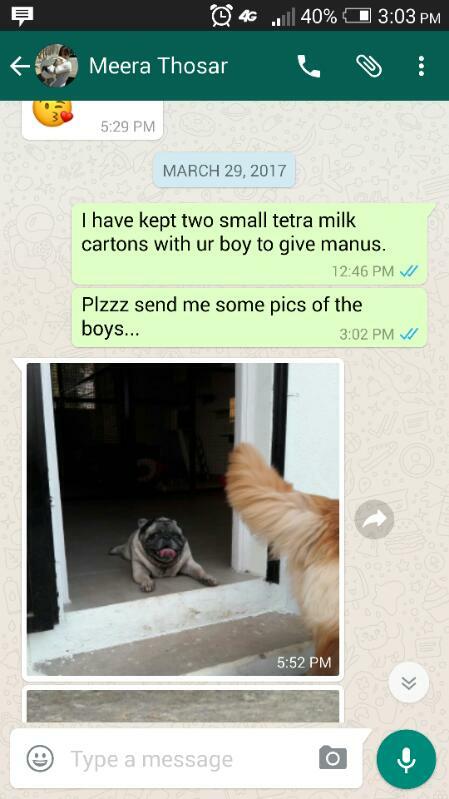 Sorry to hear this but now people should know about dog kennels and never to trust them to keep their dogs especially with Happy Tails boarding of bhugaon. Care centers like this should shut down...period. Its really disheartening to see this happening to any animal. Meera Thosar has clearly failed at her job. Her Happy Tails should be shut down. If she cannot take the responsibility why agree to do it? Her faculty doesn't even have a thermometer? All she is concerned about is money. Instead of posting an apology she posts her stupidity on Facebook? Like how did Rufus even reach to that point if he was under your supervision? Serious action should be taken against Meera Thosar and her Not so happy tails. I am very sorry to hear about this. My wishes go out to you.